You're a smart budget traveler. You've researched and found cheap airfares to get you and your family to Hawaii. You've wisely rented a Hawaii timeshare, which has saved you money over hotel accommodations, given you a kitchen to help further save money when feeding those constantly hungry kids, and you get to enjoy all of the resort's amenities to boot. Now, you wonder - how to really experience Hawaii without it costing an arm and a leg? Many of Hawaii's best beaches are practically empty during mid-day in the off season. Give the kids an exciting treasure hunt along the beach - who can find shells, scuttling crabs, even coconuts fallen overnight from the swaying palms. Or have a sand sculpture contest. Forget the sand castle - who can build a mermaid, or a pirate's chest, or a sailboat? Most of Hawaii's snorkeling bays are free. You don't need to pay a fee to be able to enjoy a spectacular underwater adventure! If you don't already have snorkel gear, you can get an inexpensive set from a local convenience store. The colorful fish, slippery eels and occasional fascinating octopus all await you. Miles of free hiking trails will take you across tropical rain forests, through towering stands of bamboo, and past splashing waterfalls. You can find easy beginner walks along the surf to advanced hikes across jagged cliff tops. Pick up trail information at visitor's centers, on the internet, and even at your own resort. Do your own research and you won't have to pay for a guided tour. All of the islands of Hawaii are blessed with abundant waterfalls - you can swim around them, walk behind them, slide down them, float in their sparkling swirls. A good guidebook will tell you exactly where to find the best waterfalls - many you can just pull off the road to see, and others will reward you at the end of a hike. Before your trip, so some research and learn where the special places are for viewing awesome vistas, and finding hidden treasures. For example, a drive across Oahu will take you past Dole pineapple fields - stop in for a free taste and a close up look at how pineapples grow. Driving around the Big Island you'll see everything from fresh lava flows to a working cattle ranch. 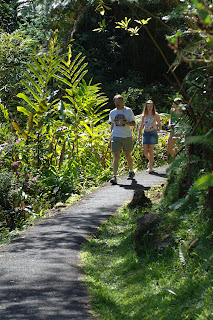 The Hana Highway on Maui is the most popular for spectacular tropical beauty. This article makes a very important point - you can really immerse yourselves in the essence of Hawaii and it hardly costs a dime. Coming from California I was stunned to find virtually deserted beaches in Hawaii. I was told that the native Hawaiian people seldom use them. It's glorious to have your family the only ones on a wide expanse of sand and surf.